Brig. Gen. Jeannie M. Leavitt (right) assumes command of the 57th Wing from Brig. Gen. Paul A. Welch, U.S. Air Force Warfare Center vice commander, during a change of command ceremony at the Strike Aircraft Maintenance Unit hangar at Nellis Air Force Base, Nev., April 15. Leavitt is responsible for 34 squadrons at 13 installations constituting the Air Force’s most diverse flying wing. 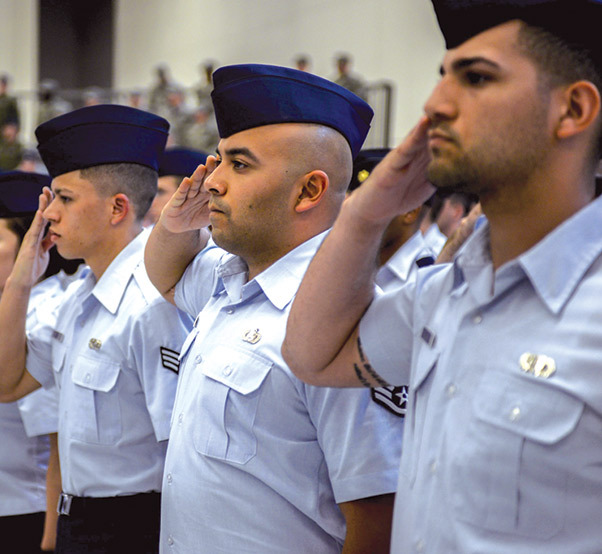 NELLIS AIR FORCE BASE, Nev. — On April 15, during a change of command ceremony, Brig. 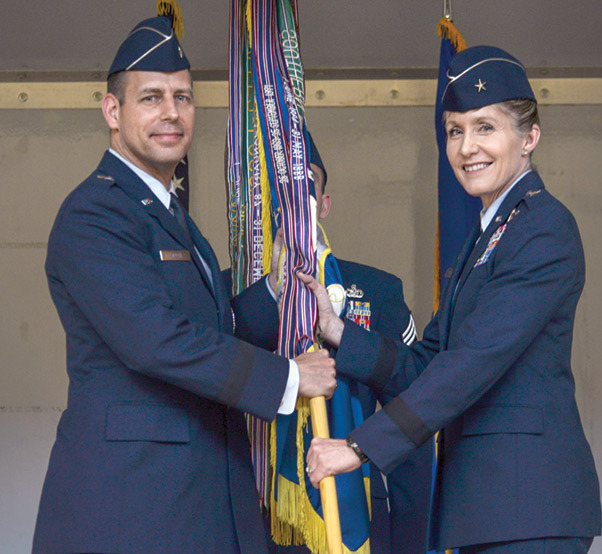 Gen. Jeannie Leavitt assumed command of the 57th Wing from Brig. Gen. Christopher Short at the Strike Aircraft Maintenance Unit hangar on Nellis AFB. Leavitt, a command pilot with more than 3,000 flight hours, including 300 combat hours, is coming from the Pentagon where she served as the principal military assistant to the Secretary of Defense. Brig. Gen. Jeannie M. Leavitt stands at attention after assuming command of the 57th Wing during the change of command ceremony at the Strike Aircraft Maintenance at Nellis Air Force Base, Nev., April 15. Leavitt, a command pilot with more than 3,000 flight hours, including 300 combat hours, is coming from the Pentagon where she served as the principal military assistant to the Secretary of Defense. 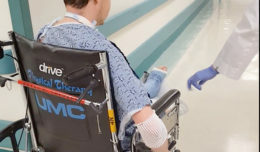 She was first stationed here from January to June 1998 during which time she was a student at the U.S. Air Force Weapons School, Weapons Instructor Course, F-15E Division. 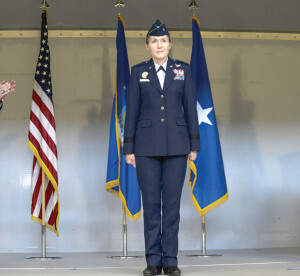 Her second tour was from June 2001 to August 2003 when she was an F-15E instructor pilot, wing standardization and evaluation examiner under the 57th Operations Group, academics flight commander, and finally as assistant operations officer for academics for the U.S. Air Force Weapons School’s 17th Weapons Squadron. This will be her third time being stationed at Nellis. 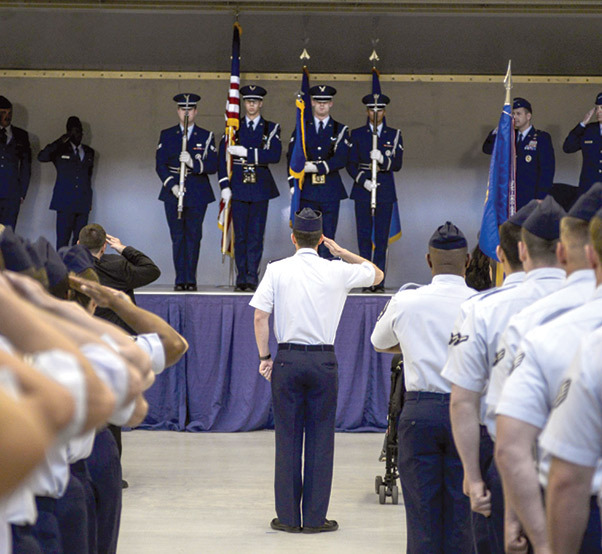 The 57th Wing is the most diverse wing in the U.S. Air Force. The Wing builds innovative leaders through tactics and advanced training to ensure world-wide combat air forces are prepared for tomorrow’s victories. In addition, the 57th Wing oversees the dynamic and challenging flying operations at Nellis Air Force Base and conducts advanced aircrew, cyber, cyber-space, logistics, command and control training through the U.S. Air Force Weapons School, Red Flag and Green Flag exercises. Brig. Gen. Christopher Short receives his final salute from the 57th Wing during the change of command ceremony at the Strike Aircraft Maintenance at Nellis Air Force Base, Nev., April 15. Short was the commander of the 57th WG since March of 2014. 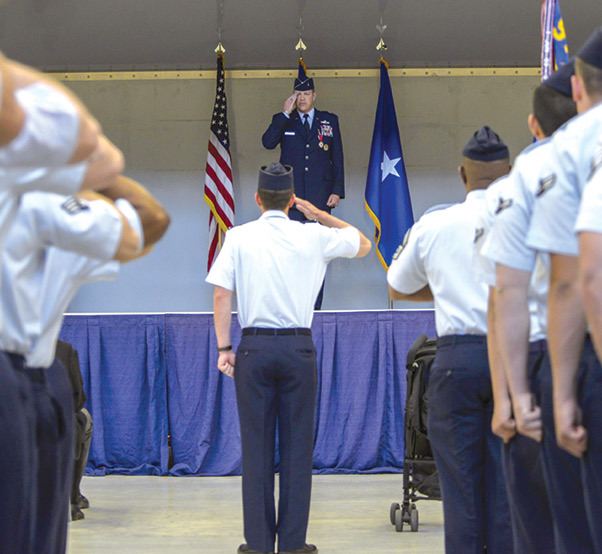 As commander, Leavitt expects to keep the 57th Wing preforming at a high level and prepare the Air Force for future success. “I plan to continue Brig. Gen. Short’s initiatives to develop innovative leaders while preparing the Air Force for tomorrow’s victories” said Leavitt. After two years as the 57th Wing’s commander, Short’s next assignment will be the senior defense official and attaché to the United Kingdom for the Defense Intelligence Agency at the U.S. Embassy in London. Airmen from the 57th Wing salute as the honor guard present the colors during the playing of the national anthem at the 57th Change of Command at Nellis Air Force Base, Nev., April 15. Brig. Gen. Jeannie M. Leavitt assumed commanded from Brig. Gen. Christopher Short during the ceremony at the Strike Aircraft Maintenance Hangar at Nellis AFB. Airmen from the 57th Wing salute as the national anthem is played at the 57th Change of Command at Nellis Air Force Base, Nev., April 15. The 57th WG oversees the dynamic and challenging flying operations at Nellis Air Force Base and conducts advanced aircrew, cyber, cyber-space, logistics, command and control training through the U.S. Air Force Weapons School, Red Flag and Green Flag exercises.